Your Arizona driver’s license will last you more than five decades, but eventually, it will expire. 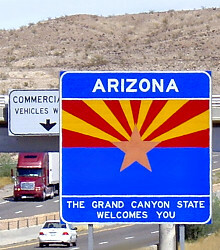 Arizona is so far the only state which allows its state-issued driver’s license to expire. On your 65th birthday, your state-issued driver’s license will cease to function, requiring you to renew your license in person. Then, every five years you will be required to renew your license after passing a vision test. When you reach age 70 you will no longer be able to renew your driver’s license by mail and will need to renew in person. Arizona takes these steps to ensure that drivers of a certain age have the physical ability to safely operate their vehicle on state roads. It is a fact that as we age our bodies simply do not function the same way they did when we were younger. Our vision can decline, our hearing can decline and even our ability to react and respond quickly can all face decline as we age. This has led some safety experts to recommend that senior drivers be tested more often to ensure that they meet minimum safety requirements for operating a motor vehicle. Proponents of senior living say these requirements are not needed because senior drivers are not the most dangerous group on the roads today. In fact, they say, considering they represent a small percentage of drivers on the road they account for an even smaller percentage of serious accidents. The National Highway Traffic Safety Administration still ranks teenage and first-time drivers as the group most at risk of being involved in a fatal vehicle collision. And vehicle crashes remain the number one cause of death for teenagers. ARIZONA: Licenses expire on the 65th birthday, and until then drivers only need new photos every 12 years — making Arizona unique in how long a license can last. Starting at 65, drivers must renew every five years, with a vision test each time. At age 70, renewal can no longer be done by mail. While you are making sure that your license hasn’t expired, it may be wise to make sure that your car insurance hasn’t expired either! Insurance companies are supposed to ask you if you would like to renew your current policy, and in some circumstances, they will renew your plan at a higher rate without you even noticing! Make sure this hasn’t happened to you. Be certain you are paying the best rate on your auto insurance. Each state has its own rules on driver license expiration and renewal. Taking a defensive driving course is a good way to learn about your state’s rules and to learn defensive driving facts and techniques for all ages.